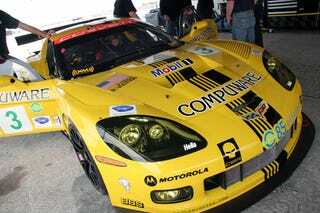 Here's the new look of the Corvette C6R for the 2008 season of ALMS racing. The changes to the new "Victory Yellow" vette include blackout headlights, black BBS wheels, a reborn BlackTail and the all-new "Scrape Stripe." Oh and yeah, check it out — Badboy Vettes even got their URL on the front, right above the splitter, and right below a pretty little "Jake." How do we swing that? Seriously — when the Pontiac G8 ST starts to race, we're totally going to be all over that. Oh and one more thing — there's a contest, so click the jump to find out all about it. "First fan to guess the inspiration for the 'Scrape Stripe' design gets an autographed official 'team-only' CR '08 hat. Send your guesses to eddie@badboyvettes.com"